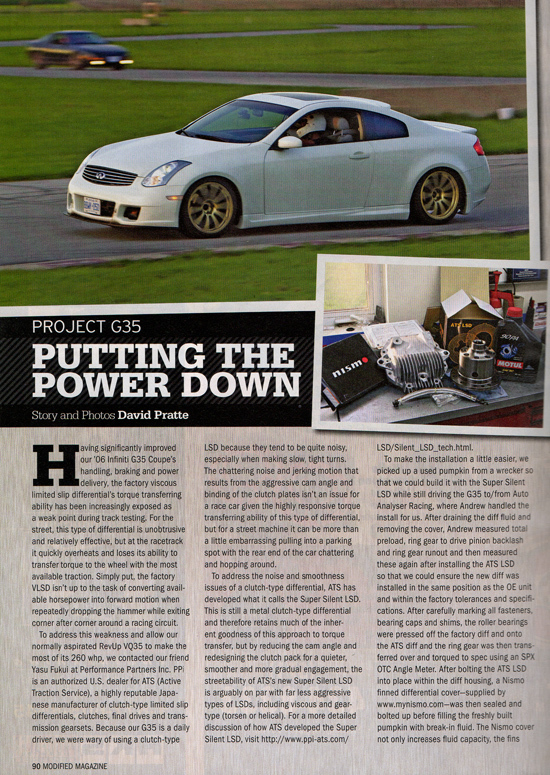 An ATS super silent LSD has been installed on the G35 of Modified Magazine. November 2009 issue of Modified Magazine reports the detailed installation and brake in process and the driving impression of the super silent LSD. At the time of the installation, there was a slight chattering noise remained. However, we met the owner Dave Pratte on the SEMA show 2009 and he told us that the noise was completely gone and that he was quite satisfied with the performance and quietness. Copyright 2008 Performance Partners International / ATS. All rights reserved.